Eventually one of the most popular and longest standing German Gothic / Electro acts has come back home to the label where everything began : Trisol. New album "Namenlos" can be regarded as the musical and conceptual peak of their career as it deliberately combines the coarse style of the their beginnings with the qualities of their most successful album "Dann Habe Ich Umsonst Gelebt" and offers a mixture of hard but melodic electro sounds with aggressive and distorted male vocals and emotional melodies with Sonja's crystal-clear hymn-like voice. Pounding industrial beats meet heart-breaking Dark Wave synthetic harmonies and reflected German poetry opposes angry English lyrics. 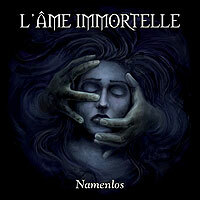 L'ame Immortelle certainly continues to unite extremes. This Standard Edition Double CD comes presented in a jewel case with 20 page glossy booklet.